Lagos, an adopted African Pygmy Hedgehog.Rescue groups often help other pets besides dogs and cats. Hedgehogs turn up becuase of the exotic pet trade. 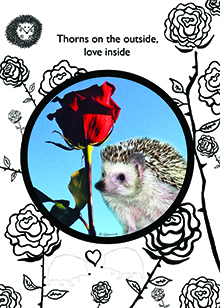 "Thorns on the outside, love inside"